A few years back I had a dream; a rather strange dream, even by my standards. For starters it was in flickering black and white and set in what appeared to be London, early 1900s. It didn’t have the most elaborate plot for a dream that had taken the time to set itself in a period that I know very little about, nor is high in my consciousness, as far as I’m aware. But the dream was vivid enough to remember and invented a word that I have never forgotten. I was standing in a hotel foyer of some kind, and something dramatic had already happened. A murder, in fact. Don’t ask me how I know this, but I just did. That’s how dreams work. Alarmed, panicked hotel residents were standing in small clusters whispering to each other. The ladies held soft, embroidered handkerchiefs like comfort blankets, which they occasionally dabbed at heir foreheads. They were clearly deeply distressed. A number of old-fashioned bobbies were striding to and fro looking very official. The whole room felt thick with worry. It was then that I became aware of a Sherlock Holmes-type character walking down a corridor towards me. I say Sherlock Holmes-type for good reason. 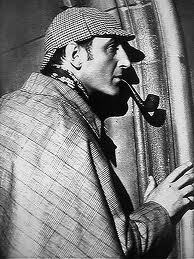 I seemed to know for sure that he wasn’t Sherlock Holmes, but he bore all the same characteristics; a fine mustache, a long fluted pipe, a deerstalker hat and one of those definitive hounds-tooth sleuth coats . There was no Watson. As he approached, I climbed two steps and met him halfway down the corridor. He seemed content to speak to me. “Excuse me mister” I said. “Do you know who did this?”. He looked at me for a moment as if deep in thought. He then removed the pipe from his mouth and took half a breath as if the answer was going to shock me. “It was Humbananabugspider,” he repeated, for clarity and for good effect. At that point I woke up, before I could even gauge my in-dream reaction. I don’t make a habit of recording my dreams, but for some reason I knew this was a word I was going to need in my life. So I reached into my draw and dug around for a pen and paper, jotting the word down without even the aid of my bedside lamp. I then slumped back into my pillow, half expecting to complete my dream, but didn’t. It ended there, leaving nothing but the barely legible scrawl of a brand new word on the back of an old restaurant invoice. Humbananabugspider. It’s my word. I invented it. And now I’m using it.